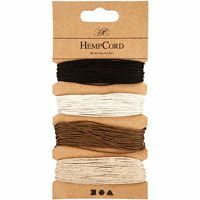 Natural Hemp Cord with a nice rustic quallity. Brown Harmony is four different shades of brown, black/brown, brown, beige and cream. Pack includes a 9m length of each colour, 0.5mm thick.